from "Mawdryn Undead", "Terminus" and "Enlightenment"
This screen seen prop was a central part of the season 20 stories that featured Turlough and the Black Guardian conspiring to kill the Doctor. 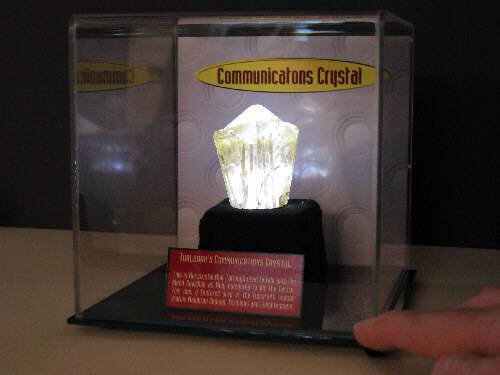 The Crystal was introduced in the Mawdryn Undead story (6A) continuing to be used in Terminus (6G) and seeing it's final demise at the end of Enlightenment where Turlough tosses it into the burning remains of the Black Guardian. There were several of these used during the production and this one is one of the lesser quality copies used in some of the SX shots. Turlough enters into a contract with the evil Black Guardian in a desperate attempt to return to his own planet. You Must Kill the Doctor! 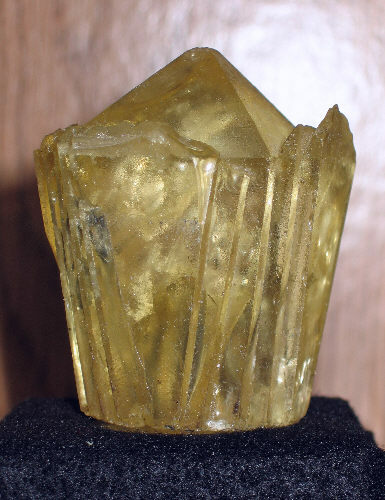 Jo Healy of Worcester Park England purchased the crystal at the April 4th1983 Longleat auction. 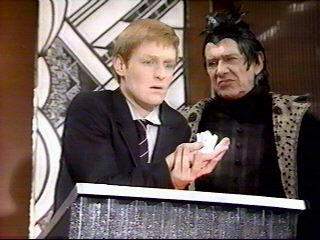 It was item number 66, described as Turlough's cube. It remained in her collection until I bought it from Jo in September of 2004. It is now on display in my Dale City Virginia collection. 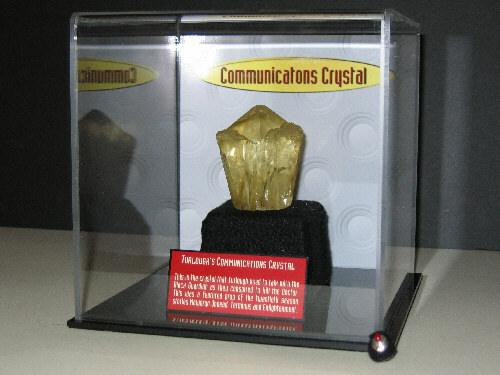 I made the display from a commercially available 6"X6"X6" Acrylic display box. Adding a roundel backdrop and banner using my favorite graphics program. On screen the prop was usually seen radiating a brilliant light so I felt it had to be displayed that way. I made a 2-inch cube out of foam core board. Then using the parts I removed from a LED flashlight, made the cube shine a bright beam of light straight up. Tidied it up with black felt and wired a button on the front of the acrylic base. Press the red button and the crystal lights up beckoning the Black Guardian.